Note: No emails will be sent to clients when you upload your outreach list, it just adds them to your dashboard. What are typical conversion rates? 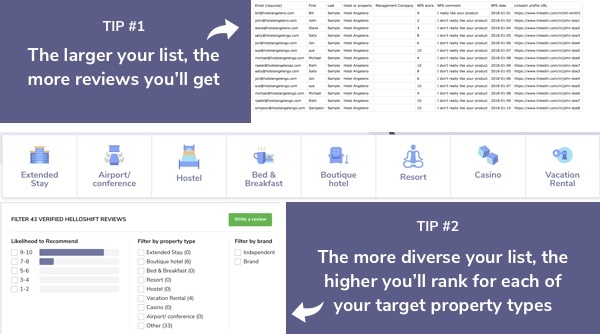 Conversion rates are generally around 5-20% when campaigns are run properly (yes, hoteliers are very busy!) so we'll need to take that into consideration when building our list. How big should my outreach list be? If this is your first campaign - we recommend looking at the category average and multiplying it by 5-8x based on the conversion data above. Head to your vendor dashboard homepage and look for the 'My products' summary. Here we see that the category average is 20 reviews (Hotsoft is 19 below the average with 1 review). Therefore we want to build a list of 160 clients for our initial outreach. If we have already run a review campaign in the past and want to be a real category contender, we're going to build a list based on the category leader. In that same image above, we see that the category leader has 111 reviews so we'll want to multiple 111 x 5 to build a list of 555 clients for our outreach. How do I know which clients I should add to my list? Reach out to users, not just your key contact on property. There are lots more potential reviewers than just your key contact on property. Every staff member that uses your product is a potential reviewer so reaching out to more than just one key contact on property expands your review reach exponentially. What format should my list be in?